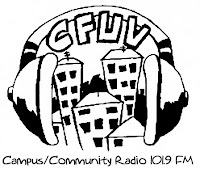 To sum my day up you should read my Facebook status: "Natasha Enquist played on the radio, sang on the Royal Theatre's stage, and helped save a Stradelli Accordion today :)"
This morning I went up to the University of Victoria's Student Union Building (The SUB), to be on UVic's CFUV 101.9 FM Radio. The show I was on was the Italian broadcast, time slot of 11am to 12:30pm with the hosts Lorenzo and Aldo, two lovely Italian men. 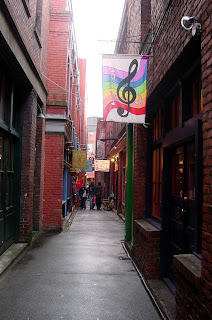 I was invited by Martin Hergt (owner of Tempo Trend aka THE Accordion shop in Victoria BC) in company with Ivan Preanicov. All three of us, with our accordions in our embrace, played on the radio to help with the annual fundraiser for the radio stations longevity. After this I rushed home, had some lunch and then went to the Royal Theatre to be a part of the Joy of Life Choir's performance. Led by the amazing Daniel Lapp, we sang backup for three Tenors, for the performance of "SING! "- a sing-a-long concert with a lot of religious churchy music. 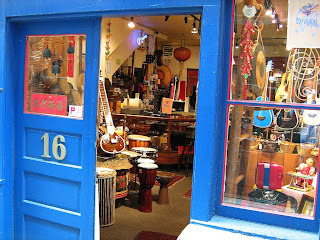 The sweet little music shop in Fan Tan Alley --Dragonsong--closed it's doors today forever. I dropped in yesterday to pay my respects. They always sold Accordions, they were always in rough shape though. Yesterday I noticed a beautiful black Stradelli, and unfortunately am not in the market for a new addition to my Accordion family and also don't have the money to spend on another instrument. I played him for a bit and said goodbye. I was informed by Hank Pine that this Stradelli was the shops baby, and today after playing with Martin on the radio insisted he go down to Dragonsong and buy this Accordion and save it from being seized by an unfortunate auction. It will be fixed up and have a wonderful new home in no time! Yay! If you can't save the world with the Accordion everyday, hopefully you can save an Accordion from the world.